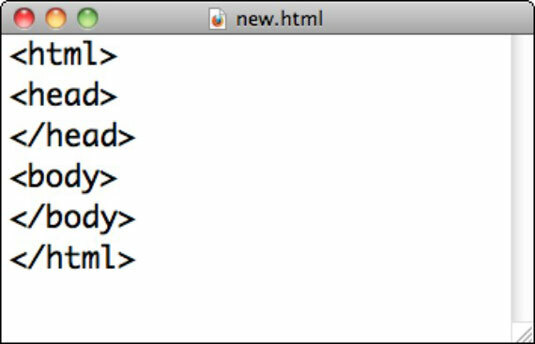 Before you start coding HTML, consider the options in terms of a coding environment. There is a wide spectrum of tools, ranging from the free text editor that came with your operating system (like Windows Notepad or TextEdit on a Mac) to professional applications (most notably Dreamweaver) that provide substantial tools to help you write, and test, code. The app is already installed on your computer. Done and done. This route is definitely the no-frills option, lacking code-hinting and checking features available in free downloadable code editors. Unless you’re planning to do only a minimal amount of HTML coding, download a free code editor like Text PSPad or Text Wrangler. 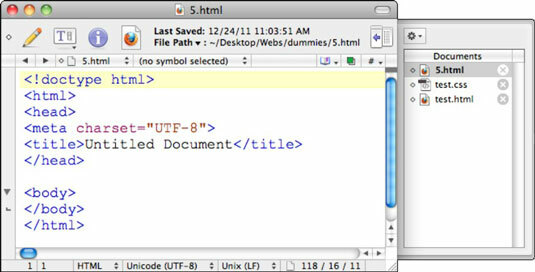 Creating HTML with TextEdit on a Mac. 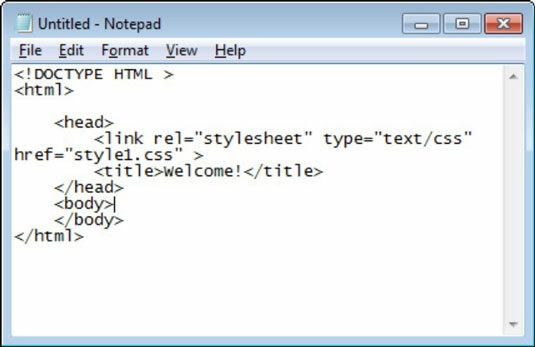 Creating HTML with Notepad in Windows. Free, downloadable code editors: Behind Door #2 are free code editors, like TextWrangler for Macs or PSPad for Windows. File tabs that allow you to work with multiple files at the same time. This capability is essential for working with an HTML and a linked CSS file at the same time. Color coding that identifies coding syntax elements. You’ll find this feature very helpful when you’ve mistyped some code because that mistyped content won’t adopt the expected color code. Spell check is available in free code editors like TextWrangler and PSPad to help identify misspelled words on the fly. Autocomplete is included in PSPad. Free code editors like TextWrangler (for Macs) and PSPad (for Windows) do not come with WYSIWG graphical windows that display how HTML pages will look in a browser. 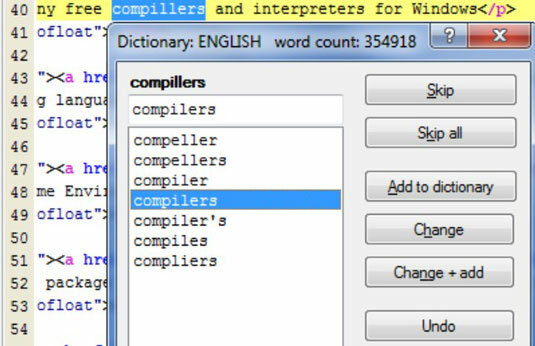 And they lack the kind of code-hinting options available in code editors that cost money. The most powerful tool for working with HTML is Adobe Dreamweaver. 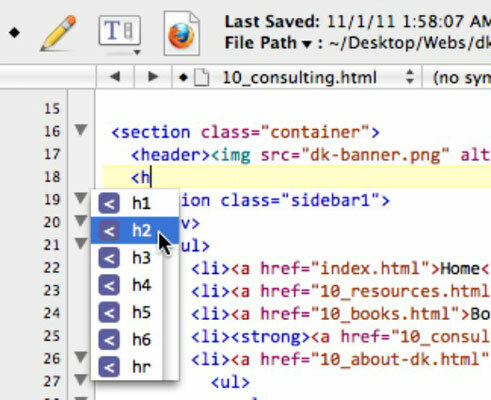 In addition to the features found in advanced, professional code editors (like spell check and code hinting), Dreamweaver’s main attraction is that you don’t have to hand-code HTML. You can, instead, use menu options (like “Insert→Image”) and panels (like the Properties inspector) to generate HTML. 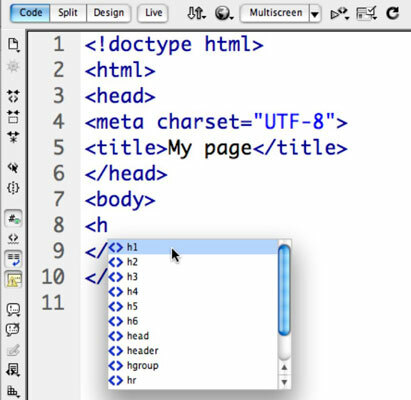 Design view: In this view, code is generated with menu and mouse actions hidden. As noted, Dreamweaver’s biggest draw is that it allows designers to generate HTML (as well as CSS and some other coding) in a design window that looks and feels something like other Adobe Creative Suite apps like Photoshop, Illustrator, or InDesign.